Amelia Dyer, centre, after her victory at the National Shooting Centre. 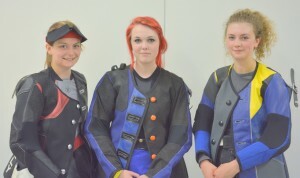 SIXTEEN-year-old Amelia Dyer from Frome competed as part of the Great Britain team at the Junior International Shooting Match held at the National Shooting Centre in Bisley at the beginning of August. 189 competitors from South Africa, Denmark, Germany, Ireland, Isle of Man, Jersey, Scotland, Wales and England took part in this year’s competition, competing in air rifle, air pistol and rifle events. Day three of the competition saw Amelia take part in the Women’s 10m Air Rifle event and, with a score of 395.3 (ex.436), got into the final in 7th place. Up against three other GB team mates and top shooters from Germany and South Africa, Amelia took control of her nerves and, with each shot, slowly eased her way into taking the individual Gold medal and set a new match record for a final’s score. Amelia’s original score of 395.3 also saw her win the Silver medal as part of the GBR Blue Team. The GB Team were delighted with the results as all three individual medals were won by GB shooters, all of whom train with the GB Junior Target Rifle Squad and the Team England National Shooting Academy. The organisers of the Junior International Shooting Match launched a new website this year in order to give wider support to the event. The website also had a video link showing a number of the matches and all the finals, which allowed for families and friends across the globe to watch events unfold at Bisley. This proved extremely popular with the families of the South African competitors and the American team who were unable to take part this year but wanted to keep abreast of the competition. Amelia is now back in training with the British Junior Airgun Championships only a month away.